of Woburn, September 7th , at eighty-four years of age. Beloved wife of nearly 62 years to Robert W. Dunnigan. Loving mother of Nancy King, her husband Arthur of Bartlett, NH, Robert Dunnigan, Joseph Dunnigan, his wife Laurie, Susan Slagmolen, her husband Dirk, Kathleen Mann, her husband Michael, all of Woburn and Michael Dunnigan of Portland, ME. Cherished grandmother of Jessica King-Lambert, her husband Chris, Matthew King, Ryan Dunnigan, Emily Dunnigan, Dirk Slagmolen, his wife Kristen, Kristen and Douglas Slagmolen, Caroline Mann-Villalobos, her husband Jorge, Allison Mann, and Samantha, Jacob, Abigail and Michael Dunnigan. Dear sister-in-law of Betty McDonough of Freedom, NH and Patricia Dunnigan of Salisbury. Also survived by many nieces and nephews. A Funeral will be held from the Lynch-Cantillon Funeral Home, 263 Main Street, Woburn on Tuesday, September 11th at 9 a.m. followed by a Funeral Mass in St. Charles Church, Main Street, Woburn at 10 a.m. Interment in Calvary Cemetery, Woburn. Relatives and friends are respectfully invited to calling hours, Monday 3-7 p.m. In lieu of flowers remembrances may be made in honor of Lauretta to the James L. McKeown Boys & Girls Club of Woburn, 1 Charles Gardner Lane, Woburn, MA 01801. 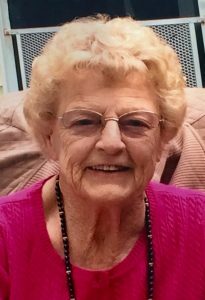 Lauretta M. (Hargrove) Dunnigan, 84, a lifelong resident of Woburn, died peacefully, Friday, September 7th at the Lahey Clinic in Burlington with her family by her side. She was the beloved wife of Robert W. Dunnigan with whom she would have celebrated 62 years of marriage on October 6th. Born and raised in Woburn, Lauretta was the last surviving of 6 children, born to George and Kathleen (O’Doherty) Hargrove. She was a 1951 graduate of Woburn High School. Even as a lifelong resident of Woburn, Lauretta was extremely proud of her Irish heritage. Lauretta started her career working at City Hall in Woburn. As her children grew, she resumed working and took a position at Woburn High School in the Housemaster’s Department. Later in her career, she returned to Woburn City Hall working in the Assessor’s Department. Lauretta was very well respected and enjoyed helping the public. She had many friends during her years working for the city. As Lauretta raised her family, she continued to stay involved in the community. She spent countless hours volunteering at her children’s schools, the Woburn Boys & Girls Club and St. Charles Church. Her favorite hobbies were sewing, knitting, quilting and donating her beautiful work to various charities. When her children were young, sewing each and every Easter outfit was important to her. When her grandchildren came along, she was known as “Nina”. Nina loved her grandchildren popping in and out of her home. At Halloween, everyone would receive a costume handmade by Nina. Every Thursday night for many years, Nina & Papa would host “Pizza Night” for their family and any friends that happened to stop by. These gatherings were filled with laughter and love. Lauretta was an avid Red Sox fan. Together with her husband Bob, they would never miss a game. She knew every player and was looking forward to the playoffs this season. She also enjoyed her gardens and the wildlife around their home. In her retirement years, Lauretta and Bob traveled extensively all over the United States and Europe with their dear friends, as well as, day trips to Foxwoods, Mohegan and her weekly bingo with her girlfriends. One of her favorite trips was to Ireland where she had the chance to visit her mother’s family. The Dunnigan family has lost their matriarch and the community of Woburn has lost a true treasure. Along with her husband Bob, Lauretta is survived and will be deeply missed by her children, Nancy King, her husband Arthur of Bartlett, NH, Robert Dunnigan, Joseph Dunnigan, his wife Laurie, Susan Slagmolen, her husband Dirk, Kathleen Mann, her husband Michael, all of Woburn and Michael Dunnigan of Portland, ME. Cherished grandmother of Jessica King-Lambert, her husband Chris, Matthew King, Ryan Dunnigan, Emily Dunnigan, Dirk Slagmolen, his wife Kristen, Kristen and Douglas Slagmolen, Caroline Mann-Villalobos, her husband Jorge, Allison Mann, and Samantha, Jacob, Abigail and Michael Dunnigan. Dear sister-in-law of Betty McDonough of Freedom, NH and Patricia Dunnigan of Salisbury. Also survived by many nieces and nephews. A Funeral will be held from the Lynch-Cantillon Funeral Home, 263 Main Street, Woburn on Tuesday, September 11th at 9 a.m. followed by a Funeral Mass in St. Charles Church, Main Street, Woburn at 10 a.m. Interment in Calvary Cemetery, Woburn. Relatives and friends are respectfully invited to calling hours, Monday 3-7 p.m. In lieu of flowers remembrances may be made in honor of Lauretta to the James L. McKeown Boys & Girls Club of Woburn, 1 Charles Gardner Lane, Woburn, MA 01801. Bob and family. so sorry to hear of your wife’s passing, there are some tough days ahead Bob, but with all the friends you have and family they can make the bad days a little easier. So sorry to hear of Loretta’s passing. She will surely be missed by so many. May memories of so many happy times comfort you now and in the difficult days to come. So sorry in your loss. My deepest sympathy. Bob and Family, words seem inadequate to express the sadness we feel about Lauretta’s passing. With sincere sympathy, may beauty live on in your memories. May the Lord bless you and send His Peace upon you. God bless this family. Mrs. Dunnigan was a very kind and amazing lady. Our thoughts and prayers go out to the entire family. Our thoughts and prayers are with you all. The ones we love are never gone but live within our hearts. May you know peace and comfort.